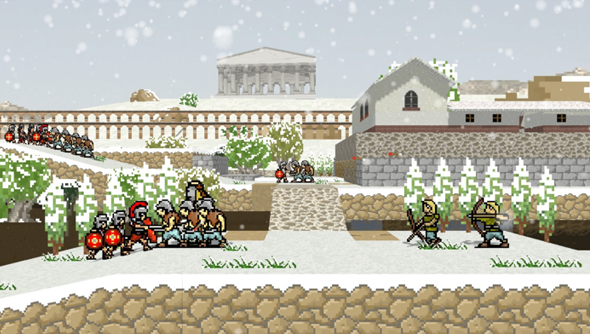 Soldier, have you got what it takes to command mighty Rome’s troops on the battlefield? To take its armies and spread them across the globe fighting in the style of our forefathers, walking back and forth along a linear plane, occasionally moving to a parallel plane either in the fore or background? That’s what former LucasArts developers SeaCliff Interactive ask of you in Super Roman Conquest. So your troops march up and down on a linear plane until they hit a wall, attempting to slice and dice any foes in their past. At a wall, like Lemmings before them, they turn back and march the other way. If you’ve still barbarians to batter then you’ll need to push your legions onto one of the other planes. Combat looks to be a matter of organising your troops into a wave that best counters the enemy types before them. A little like the reverse tower defence game, Anomaly Warzone Earth. Outside of the game’s battles you recruit troops, decide where to attack next, train your men, and make decisions that affect the morale and supplies of your army. For instance, upon defeating a Goth horde to you execute their leader of take him prisoner? Your choice will ahve ramifications later. The team are looking to raise a fairly reasonable $30,000 to make Super Roman Conquest possible with an eye towards a release next summer. If you’d like to know more about the game or, even, pledge your support you can do so on their Kickstarter page.